Globalisation seems to be producing ‘international films’ (films made in English and in ‘universal’ genres) at a faster rate than at any time since the 1960s. This is particularly noticeable in the case of The Salvation which takes us back to the European Westerns of the 1960s-70s. I’ve racked my brains to think of a Danish national dish that would help to name this genre revival alongside ‘spaghetti’, ‘sauerkraut’, ‘tortilla’ and ‘paella’ – not to mention ‘curry’. It’s a silly game but it does point to the same seeming urge to create a Western which fuses the elegaic style of John Ford with the operatic tones of Sergio Leone. 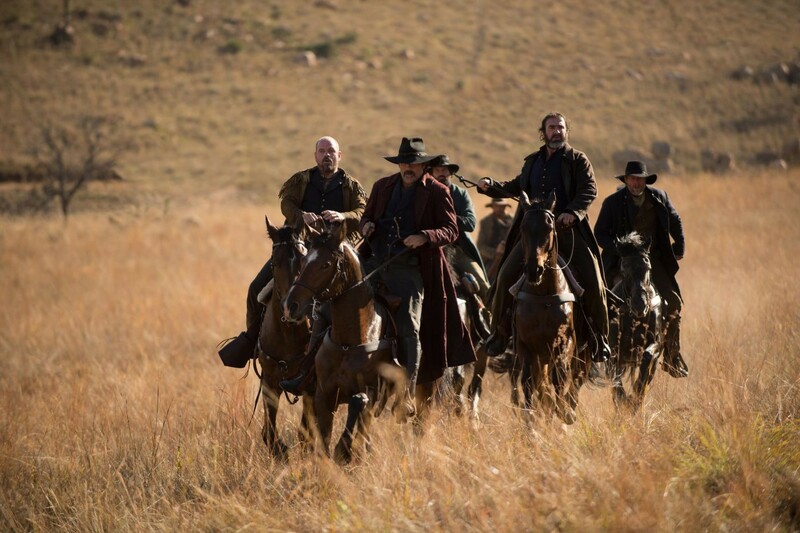 As Ed Buscombe, the doyen of UK film scholars dealing with Westerns, points out in Sight & Sound (May 2015), The Salvation is unusual in not being a ‘revisionist’ take on the genre like most of the occasional westerns of the last few years (see our recent post on The Homesman). Instead it is resolutely traditional in combining plot elements from High Noon and the style of Eastwood’s High Plains Drifter (1973) with direct nods to various other well-known Westerns. It does have the presence of ‘sticky oil’ which poisons the water supply and is seen by the villain as the potential source of wealth but Buscombe suggests that this element too was already present in a Gene Autry film from the 1930s. This is a classy production from Zentropa and its British and South African partners. The solid cast is headed by Mads Mikkelsen, effortlessly portraying the taciturn western avenger and Eva Green as a mute femme with eloquent eyes. The supporting Brits include Jonathan Pryce and Douglas Henshall. Eric Cantona gets a couple of lines but the sole American Jeffrey Dean Morgan almost steals the show as the villain Delarue. The creative team is entirely Danish with a pedigree that goes back to the early Dogme films. Director Kristian Levring directed Dogme #4 The King is Alive (2000, set in Namibia) with co-writer Anders Thomas Jensen (who also wrote Dogme #3 Mifune (1999)). 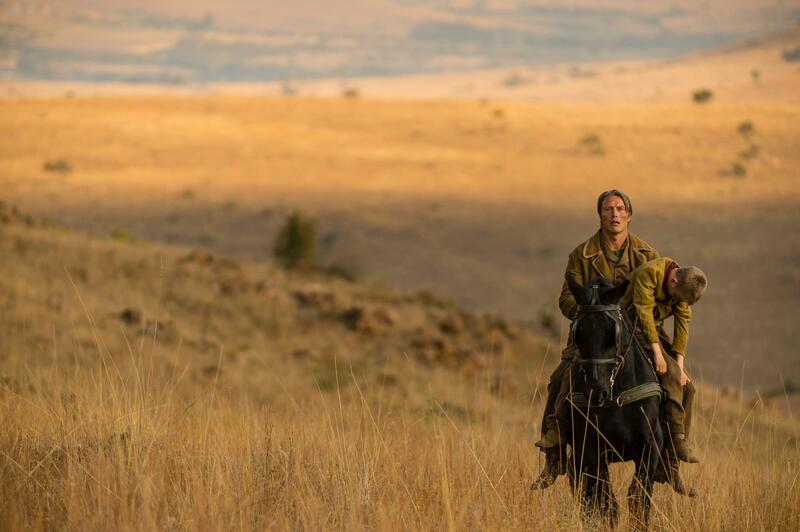 DoP Jens Schlosser had also shot The King is Alive and his knowledge of Southern Africa must have contributed to the single most striking aspect of the film’s visual style. Most of the film was shot in South Africa and as far as I can see, the two settlements portrayed in the narrative were built as sets but there was also a considerable amount of CGI needed to turn the veldt into the high plains of North America. I did feel conscious of the ‘difference’ in the image compared to the Leone films made in Spain or the US/Mexico. It was especially apparent in the night scenes and the red skies. I’d need to see the film again to try to work out what was different in the image. This distraction didn’t last long and I quickly forgot about it as the narrative progressed. Madelaine (Eva Green) watches as her husband is buried in the remote town. The mesa behind her in the distance looks like a CGI addition to the South African landscape (although similar features are found in South Africa). I watched the film in a virtually deserted multiplex screen on a sunny afternoon. The trade view was that despite a strong showing in Denmark, in the UK the film would face a tough struggle and that was indeed the case when the opening weekend was deemed ‘soft’ with meagre returns from a wide release on over 100 screens. The wide release might seem appropriate for a film that cost €10.2 million (source Cineuropa) but I’m not sure that the film wouldn’t have done better as an arthouse release on fewer screens – despite its solid genre basis. A couple of years ago I chose Louis Malle’s clever spoof of aspects of the spaghetti Western, Viva Maria! (1965) for an evening class public screening and was pleased by the response. I didn’t expect to attract a younger audience but the older arthouse audience generally enjoyed the film. There is still mileage in the Western but it needs careful handling. 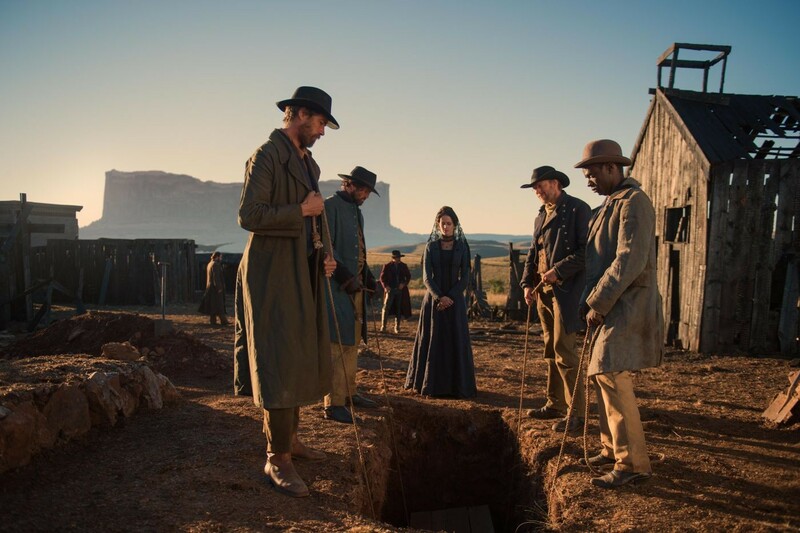 It felt like The Salvation was rather ‘thrown out’ onto screens by Warner Bros. with little promotion. It deserves a better fate and I recommend looking for it on DVD. The concept of the ‘global Western’ is discussed in Chapter 2 of The Global Film Book.